Rob practices primarily in the area of business litigation bankruptcy, bankruptcy litigation and appeals. In business litigation, he has served as lead counsel for businesses and individuals in numerous cases in both state and federal courts. Rob’s litigation practice includes handling appeals. 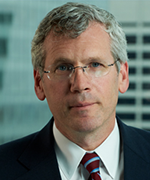 In the Bankruptcy area, Rob has represented a wide variety of interests in chapter 11/13 cases and adversary proceedings, including chapter 11 debtors, secured creditors, plaintiffs and defendants in chapter 5 avoidance actions, plaintiffs and defendants in non-discharge actions, chapter 11 trustees and creditor’s committees. Rob routinely handles matters in New York State trial and appellate courts as well as the United States District Courts and Bankruptcy Courts situated in the Southern and Eastern Districts of New York. Rob regularly assists his clients with general business matters including contract negotiations, business purchase/sale transactions, commercial leases, i.p. licenses, employment matters, and trademark matters (including Federal Trademark applications). He has functioned in the role of “outside general counsel” for a number of his long-time clients. Rob is a member of the Connecticut Bar Association (CBA). He sits on the Executive Committee of the CBA’s Business Law section and has served as the section’s Secretary since 2015. Rob is also a member of the CBA’s Commercial law and Bankruptcy section. Rob has also appeared by special admission in numerous other courts and jurisdictions, including the state and Bankruptcy Courts in Delaware.